Karla Yungwirth Designs: Kitty Bee Designs Challenge #96 - Congratulations! Kitty Bee Designs Challenge #96 - Congratulations! Hi Friends! I hope you've been having a lovely week so far! I've had lots of fun creating projects lately and here's one more for you! It's time for the midweek inspiration for Challenge #96 over at the Kitty Bee Designs Challenge Blog - Aloha Friday! For my project this week I used this adorable Magic In Every Cup digital stamp from Kadoodle Bug Designs! They include a coloured image as well in case you want to simply print and use the image - and you can find the cut files for this sweet image on their site too! I printed this cutie out on white cardstock, coloured him with Prismacolor and Hobby Colour Markers and then used a Spellbinders Nestabilities die to cut out the panel and a coordinating mat. A bit of white gel pen adds highlights and some Glossy Accents added a gloss look to the beans and the unicorn's horn. I love the Congrats sentiment from the Whatnot Sentiments Five stamp set from Your Next Stamp. I first stamped it on a white cardstock background with grey ink and then used a pretty Tim Holtz embossing folder from Sizzix to emboss this gorgeous background. A bit of Distress Oxide Inks sponged over top highlighted the beautiful leaves and flowers. I used some new Kaisercraft Wildflower paper (my fav right now!!) to create a bow with the We R Memory Keepers 123 punch board and added some sequins and a cork heart from SpiegelMom Scraps. Inside, I used a sentiment and images from the Perk Up stamp set by Your Next Stamp. I thought it matched the theme perfectly! A few matching sequins from SpiegelMom Scraps decorate the inside. So fun. I love the embossed background and the bow. The inside is too cute too. 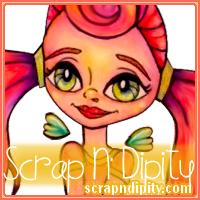 Thank you for joining the DL.ART June Linky Challenge. Those little highlights really make a great card pop. Thank you for joining us at CHNPPC.